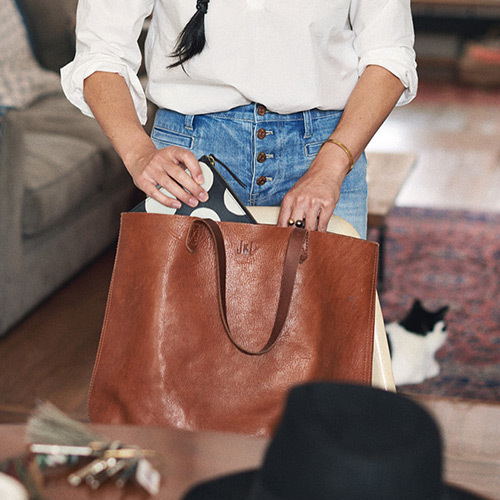 A small (but surprisingly roomy) take on our best-selling Medium Transport Tote. What goes into it? Here it is by the numbers: 2 pieces of fine leather are used for the body. 2 ways to carry: with the top handles or the detachable shoulder strap. 1 exterior pocket for those things you gotta grab fast. 1 interior side zip pocket to keep your keys, phone and wallet at the ready. 24: the number of hours in a day that this bag looks adorable. How many compliments you'll get? 500 gazillion. 19" (at shortest) to 21 5/8" (at longest) crossbody drop. 7 3/4"H x 7 3/4"W x 2 5/8"D.